To board the 7 train at Vernon Boulevard and ride it east towards Flushing is to travel through a geography more rich in language and crowded with culture than any other stretch of land in America. It is well known that Queens is among the most diverse places in the world — and the linguistic capital of the country — but often we only experience the veneers of this diversity: the sights, sounds and smells of the various communities’ ways of life. Underneath each one, however, is a deep range of stories: of remembrances of places left behind and newly arrived at; of the manner of these journeys and the attempts at carving out a space of belonging in a new home. QUEENSBOUND, a collaborative audio project brilliantly curated by the Queens poet and essayist KC Trommer, goes about collecting these stories. Fifteen Queens-based writers and poets read a piece of writing corresponding to a Queens subway stop, mapping the borough with a web of spoken images and narratives. At the Jackson Heights/Roosevelt Avenue R stop, Meera Nair considers the discordant realities in which an immigrant often lives in “In These Streets”: The speaker thinks of her grandmother’s kitchen as “a warm continent I sank into,” but also next door there is “the neighbor in 3c who wants me sent back to wherever.” Former Queens poet laureate Paolo Javier in “A True Account of Talking to the 7 in Sunnyside” at 40th Street on the 7 train, finds his favorite Korean bodega closed, and must explain to his small child the sad realities of gentrification and rising rents. And Jared Harél writes in “All Possible Fates” that while the universe might be expanding, “my apartment is not. This is balance, I tell myself” — a way for us all to come to terms with the confinements of city life. 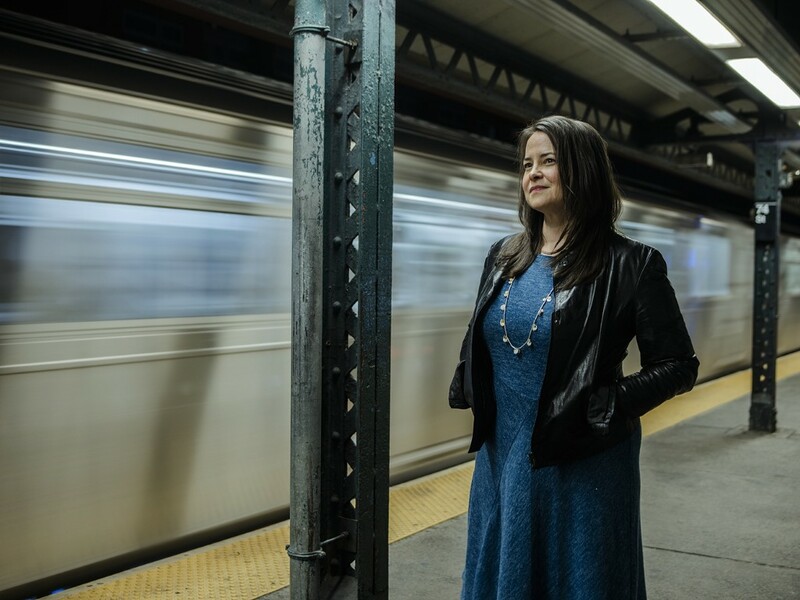 Supported by a New Work Grant from the Queens Council for the Arts, QUEENSBOUND embeds the audio of each writer reading her or his work into a subway map of Queens designed by artist Kyle Richard. The project launched on Nov. 3 with a reading on the 7 line. Attendees boarded the train at Vernon Boulevard and rode it to Mets-Willets Point, where a reception at the Queens Museum was held. After the success of the launch of QUEENSBOUND, we spoke with KC Trommer about the reasons Queens is such fertile ground for storytelling and poetry, and the importance of recording those stories. Queens Tribune: To me, QUEENSBOUND is one of those genius ideas that as soon as I heard of it, I thought, “Of course! How has this not already existed?” Can you talk about the genesis of the idea? KC Trommer: Oh, thank you for that! I moved to Queens 20 years ago — first to Astoria, then Sunnyside and now Jackson Heights — and over the years, the neighborhoods I’ve lived in have made their way into my poems. The title for the project was originally a section of my forthcoming collection, We Call Them Beautiful. Every city poet worth her salt has a neighborhood poem or a subway poem. I figured other writers I know have their share of these, so I started asking around. For QUEENSBOUND, I wanted to collect, showcase and share the amazing work of the writers I know who live in and write about the borough. I was thinking of location-based storytelling sites like Mr. Beller’s Neighborhood that embed stories on a website in the place they describe. It made sense to use the subway map as the organizing principle and as a democratic and unifying way to locate the poems and neighborhoods. My love for poetry is like my love for Queens: Poetry is an underloved genre — though not by people who read it! — and Queens is an underloved place, but not by people who live here. I wanted QUEENSBOUND to be an informal directory of poets and writers from the borough and a means of laying bare the brilliant diversity of Queens in all its glory. QT: I was also thinking that Queens is perhaps the only borough left in the city in which a project such as QUEENSBOUND could be so effective. Queens’ diversity between and within neighborhoods is a stark contrast to, say Manhattan and Brooklyn’s increasing homogenization. Do you think that Queens is especially suited for this project? KCT: In Queens, it’s possible to walk from one part of the world to the next when only traversing a few blocks — or even just a few storefronts. It’s what I have always loved about being here. Queens is predominantly an immigrant space — something which is being underscored in a hideous way by the prospect of western Queens’ becoming absorbed and homogenized by Amazon, literally at the expense of the immigrant communities who now live here. I want QUEENSBOUND to be a celebration of this space and the voices in it, not a document of a fragile ecosystem on the verge of collapse and displacement. I want to help break down hegemony of the idea that Manhattan and Brooklyn are the literary centers of New York — a perspective that, at its core, always has racist and classist undertones. Queens has no shortage of great writers, but we are not organized the way that Manhattan or Brooklyn writers are — though that is changing. I hope that the project connects Queens writers with each other and shows the strength and vibrancy of the borough’s many voices. I want QUEENSBOUND to put the lie to the idea that either of those boroughs is superior to Queens, which is full of stories block by block. For the Jackson Heights 74th St./Broadway stop alone, we have five very different poems: Ananda Lima’s “When They Come for Us on the 7 Train” about ICE agents on the train; Meera Nair’s “In These Streets,” a reflection on how her home and family from Kerala, India, is returned to her through the faces of her neighbors; Malcolm Chang’s “Kalpana Chawla Way,” which looks at the street sign and tells us about the Indian astronaut who once lived here; as well as Catherine Fletcher’s “Psalm of the Garden in the City” and Maria Terrone’s “Hawthorne Court,” both of which offer up the private and public green spaces of Jackson Heights as sites of community and reflection. As the project evolves, I would love to include more stories that offer glimpses of the quiet delights and secrets of Queens — stories that live alongside each other, despite being radically different. QT: One of the great things is actually hearing the writers read their work. It provides such a great representation of the sounds of Queens, the variety of accents. QUEENSBOUND describes Queens through the stories and poems, and at the same time transcribes the borough through the voices of its inhabitants. Was this in your mind as you were developing the project? KCT: What better way also to understand and enjoy these poems than to hear the poets read them to you? I like being read to, and part of the true experience of a poem is hearing it read well by its author. I am a lover of accents and wanted to capture those and share them as much as I wanted to share the stories that these poems and texts contain. QT: How did you go about selecting the contributors? KCT: To start, I asked poets I know to contribute and, at the same time, I asked each of them to recommend poets who they felt would make a good contribution. I was lucky to get work from 16 leading writers of Queens, a few of whom would never call themselves poets. Some contributors — like Joseph O. Legaspi, who has a chapbook called Subways — and Abeer Y. Hoque, Safia Jama, Sherese Francis, Jared Harél and Queens poet laureate Maria Lisella all had poems at the ready. I had read and loved Rosebud Ben-Oni’s “Matarose Tags G-Dragon on the 7.” And a few years ago at one of Nita Noveno’s Sunday Salon readings, I heard Ananda Lima read her poem about ICE agents on the 7. I knew when I first heard it that poem, which still breaks me every time I hear it, should be a part of the project. I learned from Meera Nair about a young poet, Belal Mobarak, whose “Where the N Train Stops” was an excellent addition. Vikas Menon, Nicole Haroutunian and former Queens poet laureate Paolo Javier wrote original work for the project. In Paolo’s case, his “A True Account of Talking to the 7 Line in Sunnyside” is a discursive narrative poem about gentrification, written as a conversation between himself and his 4-year-old daughter. I should note that there are many poets whose work I love who were not included on this first round. I’m only one woman and wanted to keep the project, in the initial stage, manageable. There are many more areas of the map that we have not covered, and many more voices and neighborhoods that I would like to include as the project grows. It’s my hope that people will go to the site and listen to the audio by clicking on the station stops that have embedded audio, but I would also love to see QUEENSBOUND become a podcast or an audio recording that you listen to, stop by stop, as you ride the train. I’m working with the web designer Maham Khan to refine our website, and I would like to bring on other writers to form an editorial board to help curate. QT: For a borough with such strong immigrant communities, can you speak to the importance of writing, both telling of stories and reciting of poetry, to the maintenance and development of identity and belonging? KCT: Without stories, we can’t go on. I’ve watched every place I’ve lived in New York change, sometimes right underneath my feet. Telling the stories of a place is a means of preserving it. We need to tell these stories in order to document and celebrate the lived experience of a place — especially in this particularly disgusting political moment in which not just the stories of immigrants but the people themselves are being displaced and erased and deported. It’s terrifying. I’m a white American woman who moved here after growing up in Maine, so I’m seeing what is happening here and to these communities more than I am directly affected by it. That said, I am also a rent-stabilized tenant and a single parent, and I want to stay in Queens, in Jackson Heights — and I want my neighborhood and my neighbors to be safe. Queens is a truly realized version of American democracy, in which people from all around the world and from different religions and backgrounds live together peacefully and, often, joyously. In answer to the hate and divisiveness we see in the United States, which keeps underscoring our difference, look to Queens and all we are. It’s beautiful here because it’s complicated. QUEENSBOUND shows that building community — literary or otherwise — is a form of resistance. Telling our stories is a means of recording our history together and showing its worth. You can’t do that in the abstract. You have to listen to people who are not like you, and respect that every single one of them is as valuable and complicated as you are. I feel like the good people of Queens understand this better than anyone. KC Trommer’s debut poetry collection We Call Them Beautiful will be published by Diode Editions in 2019.